The Rackets Division of the Brooklyn DA's office was where the author (Michael Vecchione) of this absorbing memoir "always wanted to be." With co-author Jerry Schmetterer, Vecchione invites his readers to join him in a look back at his career. Vecchione headed the division for over a decade, and was involved in several very high-profile cases that "struck Court Street like an earthquake." I have to say that it took me longer than normal to read this book, not because of the book itself but because as I started to become more absorbed in his story, I grabbed my iPad and spent quite a bit of time finding more info on these big corruption cases as I read. the crooked ADA known as the Undertaker, "the nephew of a community political leader"
two "Mafia cops," NYPD detectives who were "carrying out hits for the Mafia"
and more. Personally, the corruption doesn't surprise me -- I'm sure that these sorts of things continue to happen on a daily basis in cities throughout the United States. Crooked Brooklyn makes for compelling reading. Some of the cases in this book would also make for great movie material. 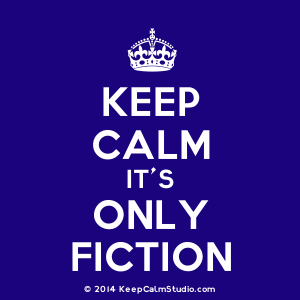 The downside is that I found it to be a little disorganized in the writing itself -- for example, Vecchione would be talking about a particular case and then in the middle of the story, would go back in time, most of the time talking about something in his personal life that would bring us right up to where he'd left off. To be very honest, from a reader point of view, when he would do that it was a bit distracting when all I wanted to do was to get back to the cases that to me were the high point of this book. 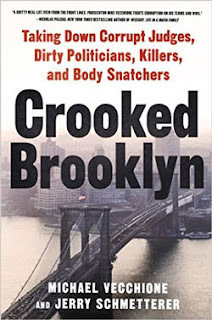 "However, the author’s focus on courtroom maneuvering and investigative procedures can become tedious without greater context regarding New York’s labyrinthine government and history of corruption." I didn't find this to be the case -- a) he does briefly touch on the Tammany machine in this book, b) it is certainly not at all tedious; in fact, the opposite is true, and c) "New York's labyrinthine government and history of corruption" are not the focus of this book, so I don't think that the reviewer is playing fair here. The dustjacket blurb says that this book is "perfect for fans of television shows like Law & Order, readers of true crime, and those hungry for details about the system that keeps us safe." Having watched hundreds of hours of Law and Order in my day (the original -- not the spinoffs), and cheering on Jack McCoy in his long-running (but not always successful) crusade for justice, I'd say that the blurber gets it right. I suspect this is good, Nancy, and with each review you write and I read, I daresay you must have been a college prof. I adore Law and Order. In more recent episodes, featuring Jeff Goldblum, I get a jolt; my late husband's twin, except Jeff G. has dark hair and my husband's was blonde: I like the sound of this book.